Working with flammable liquids can be very dangerous, therefore proper precautions and requirements must be met. It is necessary to wear properly fitted personal protective equipment as well as utilizing proper containment devices for the flammable liquid itself. Before beginning an operation or task, with handling or storing flammable liquids, make sure you know the location of the correct fire extinguisher to use in the event of a fire. Do not use materials in a flammable liquid storage indoors facility that may cause a spark, that may ignite the flammable liquid being handled. Flammable liquids give off vapors and vapors are very flammable. When disposing of flammable liquids, be sure to use a proper chemical storage building to avoid hazardous situations. Flammable liquid storage indoors needs to be separated from other chemicals, especially reactives such as oxidizers. When transferring flammable liquids from a drum to a container, completely connect the container to the drum with a bonding wire before pouring the flammable materials. Friction can cause the flammable liquid vapors to ignite, leading to ignition of the flammable liquid itself. Clearly label each flammable liquid container with readable labels. If labels are not clearly stated, call the manufacturer or distributor for a new label – they should have access to proper labels. Keep your flammable liquid storage indoors with US Chemical Storage for maximum safety and compliance. When keeping your flammable liquid storage indoors, it is necessary to use a fire rated flammable storage building. 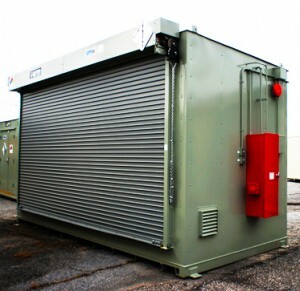 US Chemical Storage provides two fire rated buildings: FIRELoc and SUPERLoc. The FIRELoc series chemical storage building offers a 2-hour fire rated protection, where a SUPERLoc storage building offers 4-hour fire rated protection. FIRELoc storage buildings can be permanently or temporarily placed 10 to 30 feet away from occupied facilities or property lines. SUPERLoc storage buildings can be placed 10 feet or less from occupied facilities, property lines or even inside your facility. The benefit of storing your fire rated storage building inside your facility is endless. The SUPERLoc series chemical storage building provides your facilities with superior protection from hazardous situations and increases your production operations by placing your flammable storage building inside your facility. All US Chemical Storage fire rated chemical storage buildings and non-fire rated chemical storage buildings are extremely high quality and constructed from heavy duty steel. Hand-welded in the USA by certified welders and designed by our experienced professional staff of engineers for maximum product quality. Delivering the safest and highest quality chemical storage solutions in the industry. US Chemical Storage – Our Strength is Your Security.